Coach always said to keep your eye on the ball. But how can you when the fans are cheering, the spotlights are glaring—all those sensory diversions gyrating before you? As a site of spectacle, the sports arena is not unlike the gallery. 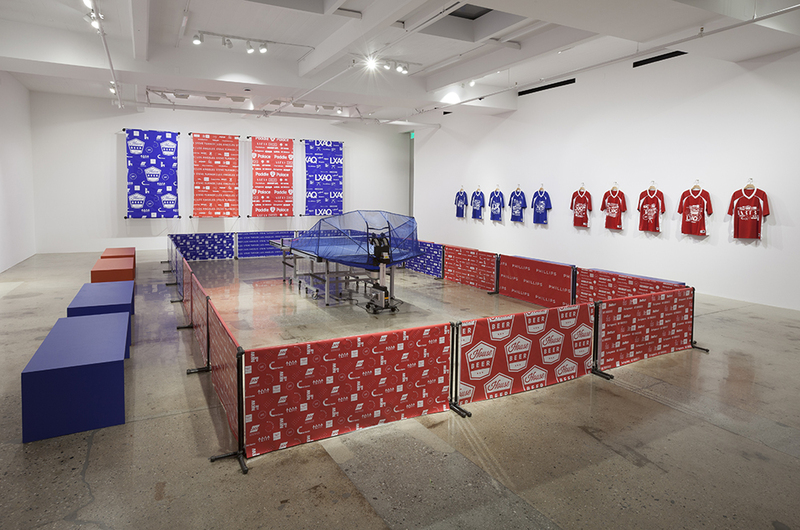 Jonas Lund conflates the structures of performance and competition that define each space, re­-creating a fantastical ping -pong arena replete with faux corporate­-sponsored sidelines, banners, and jerseys for the installation Your Logo Here, 2016. A robotic ping-­pong machine in its center whirs and thwacks as viewers are invited to clasp a paddle and hone their shots amid the athletic paraphernalia. Visitors’ practice sessions and public tournaments held in the gallery are live streamed to Facebook. These recorded performances document Lund’s setting in states of activity and lull, the unwearied machine always poised to serve a ball and compete. View of “Jonas Lund: Your Logo Here,” 2016. While the artist’s fabricated environment rings eerily true, its fine print reads as a simulation of the displays of capital emblazoned across the realm of sports at all levels. Similarly, Lund’s logos and branding name­-drop art-­world institutions and publications that have sponsored the exhibition, invoking the model of an exchange economy. He points to the system of support artists rely on from galleries, museums, and publications that buoy their careers and legacies with credentials both cultural and fiscal. Here, neither viewer nor player can dodge the strokes of our corporate zeitgeist.